There are now 36 players remaining in Event #4, which means all remaining players are guaranteed at least a $554 payday. 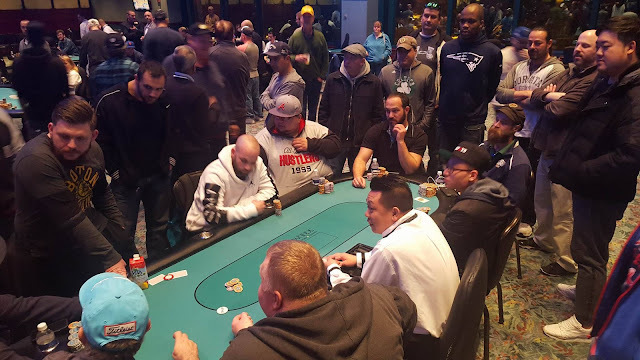 There are 37 players remaining in Event #4, with 36 players making the money. We will update again when the bubble breaks. Jonathan Reinhardt raises to 42,000 in the hijack, and Dave Stefanski calls in the small blind. Stefanski checks the [ks][10c][2h] flop, and Reinhardt continues for 52,000. Stefanski calls. 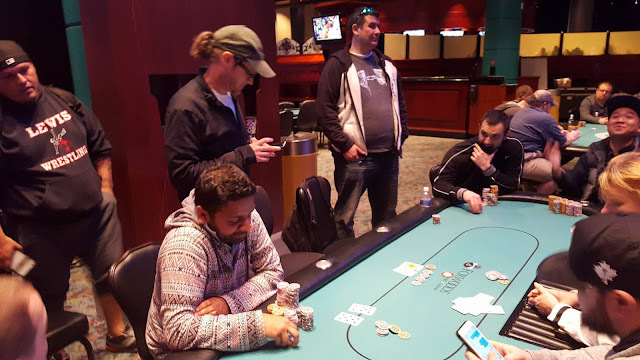 Stefanski checks again when the turn comes the [3h], and Reinhardt bets 76,000. Stefanski calls. Both players check the [3d] river. Stefanski shows [kc][js], but Reinhardt turns over [kd][qh] to win the pot. 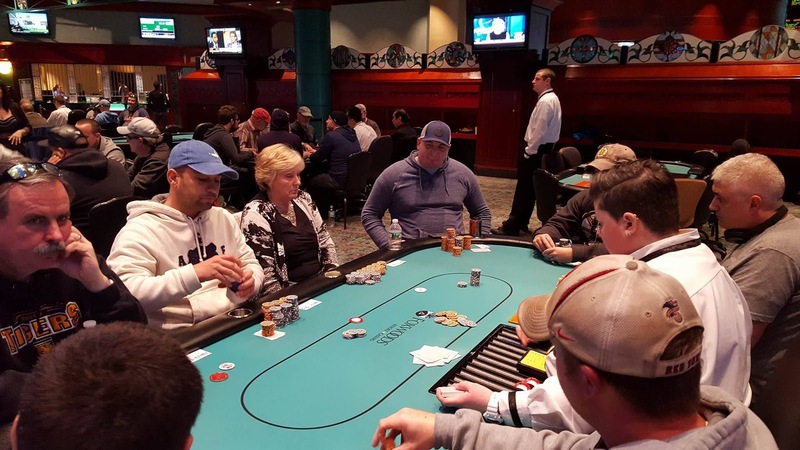 There were a total of 282 entries in today's $300 NLH Big Stack event. Gil Wasserman raises to 36,000 from under the gun. Carlo Sciannameo calls in middle position, Mark Bulbulian calls in the hijack, and the big blind calls as well. When the flop comes [10s][9d][6c], the big blind checks to Wesserman who makes it 80,000 to go. Only Bulbulian calls to see the turn. Wesserman checks the [10h] turn, and Bulbulian bets 145,000. Wesserman announces that he is all in, and Bulbulian folds. Gregory Joslyn is all in and has been called by Carlo Sciannameo. 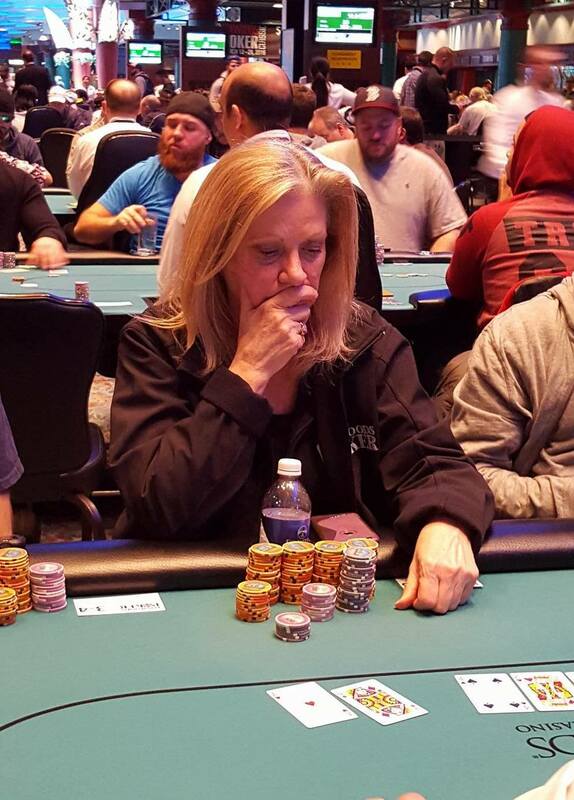 The board runs out [ad][8s][4h][kh][5s], eliminating Joslyn in 43rd place, paying $2,770. Brandon Winter shoves all in for 53,000 from early position, and a player in later position calls. Winter shows [ks][6d], and his opponent tables [2s][2h]. The flop comes [10c][6s][6c], giving Winter a set. The turn is the [6h], giving Winter quad sixes. The river is the [4s]. The remaining 44 players in Event #1 ($600 NLH) Day 2 are now on a 60 minute dinner break. 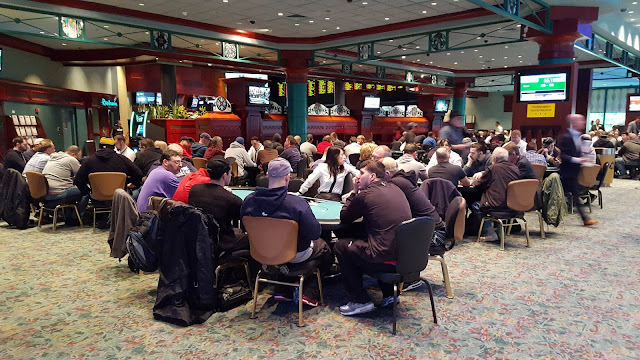 They will return to play Level 23 (8,000/16,000 blinds with a 2,000 ante). The three largest chip stacks at the moment are all seated at table 2. Greg Himmelbrand is sitting with around 1,200,0000, Gil Wasserman has just around 1,000,000, and Carlo Sciannameo also has just about 1,000,000. It should be noted that Himmelbrand has over 1,200,000 in live tournament winnings under his belt. 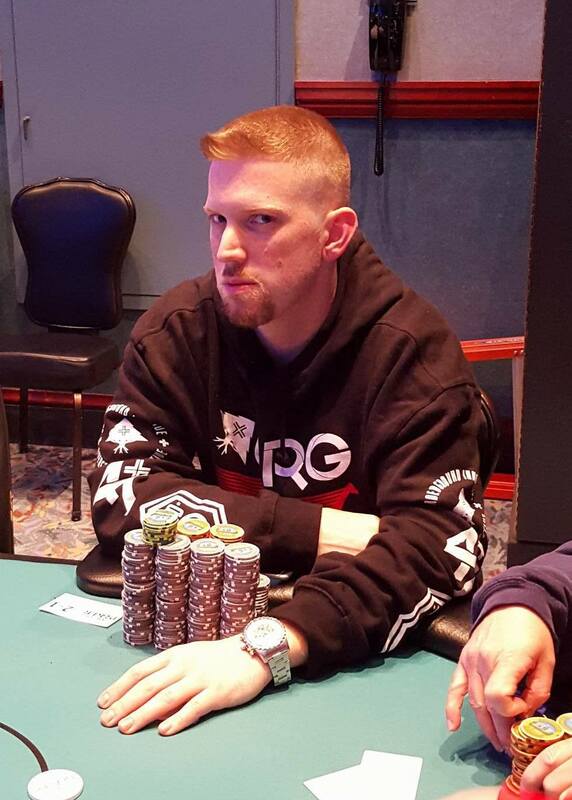 He is a two-time World Series of Poker Circuit Ring winner, as well as a Parx $500 Big Stax first place, a Mid-States Poker Tour first place, and Borgata and Wynn firsts. On a board reading [kd][7d][5c], Eric Siegel bets 17,000 in the small blind, and Neil Small calls in the big. Ronald Dalgo raises to 39,000 in middle position, Siegel quickly folds, and Small calls. The turn comes the [5h], and Small quickly announces that he is all in. Dalgo insta-calls. 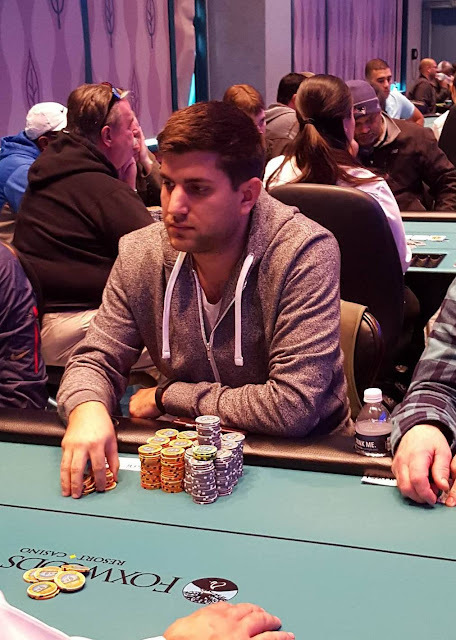 Unfortunately for Small, the [10s] river does not improve his hand, and he is eliminated in 56th place, taking home $1,890. Registration has now closed for Event #4. At the present moment there are 186 players remaining and they are playing level 11 (500/1,000 blinds with a 100 ante). We will post the prize pool information as soon as it's available. 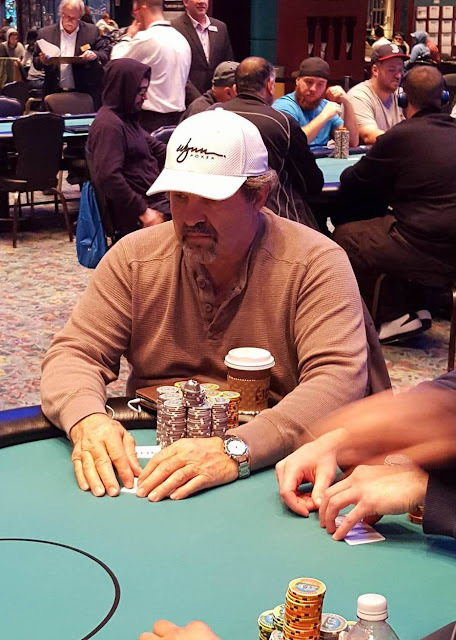 John Kinney has shoved all in, and has been called by Jeffrey Yancheck. The flop comes [qs][7s][3d]. The [kd] gives Yancheck a set, and the [5c] comes on the river. Mark Alves shoves all in from early position for 95,000. Action folds to Alfred Kapuscinski in the big blind who calls the all-in bet. "I just have two overs," Alves says as he tables [kc][jd]. Kapuscinski turns over [8d][8c]. The board runs out [ac][kd][9c][ah][7s], awarding Alves a full double. Dave Stefanski raises to 14,000 in middle position. Anthony Segarra, calls in middle position, and Stefan Parchev re-raises to 45,000 in the cutoff. It folds to Robert Garrett in the small blind who thinks for a minute and four-bets to 120,000. Stefanski and Segarra both fold. With action back on Parchev, he announces that he is all in, having Garrett covered. Garrett shrugs his shoulders in disgust and sits back in his chair to think. After nearly three minutes in the tank, Garrett throws his cards face up into the muck, showing [kd][kc]. Parchev slowly shows [ac][ah]. "Sick fold," a player at the table says to Garrett. Garrett responds, "Doesn't feel like it after putting 120,000 into the pot." The remaining 93 players are now on their first 15 minute break of the day, during which we will have a color-up to remove all of the 500 chips. Play will resume with 3,000/6,000 blinds and a 1,000 ante. Judith Annis raises to 16,000 from under the gun. It folds to Billy Papadopoulos who shoves all in, having Annis covered. It folds back around to Annis who announces a call. The board runs outs [as][ks][9d][6h][6d], awarding Annis a full double up. Matthew Bretzfield makes it 11,000 in the cutoff. 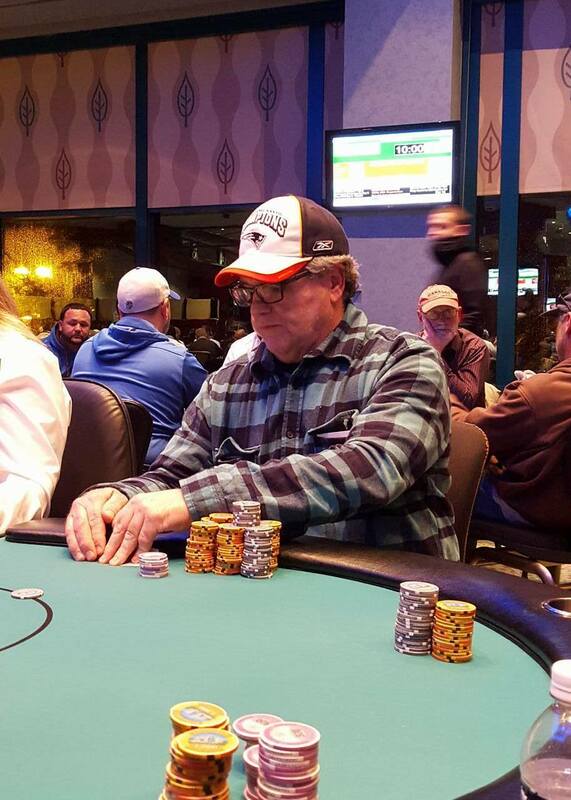 Action folds to Donald Lohr in the big blind who shoves all in for nearly 40,000. Bretzfield calls. 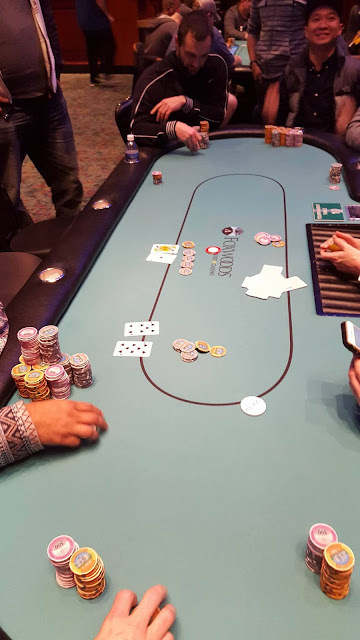 The flop and turn come [jd][8s][7s][5c], but the [3d] on the river gives Bretzfield a set, and eliminated Lohr from play early in Day 2. Just one level into play, we are already down from 149 starting players, to 123 remaining players. For payout/prize money information please see this link. We will keep you updated throughout the day as to players remaining, etc. We are also running a live stream at www.foxwoodslive.com for those wishing to view action in real time. There are currently 118 entrants and counting in today's Event #4 ($300 NLH Big Stack). Any player wishing to enter/re-enter has until the start of Level 11 to do so. Players start with 30,000 in chips. Levels 1-25 are 20 minutes in length, and Levels 26+ are 30 minutes. Full structure sheet and details can be found here. Chris Orme may just be the very definition of patience. Earlier tonight he was all in for five big blinds and quadrupled up. This hand, on the stone cold money bubble, he found himself down to less than a single big blind and was forced to go all in for 1,500 in the big blind. Nearly all of the remaining 69 players gathered around the feature table to watch the hand play out. A player in middle position limped in for 5,000, the crowd boo'ed. The hijack also limped, and the crowd boo'ed a little louder. The cutoff and big blind also called. 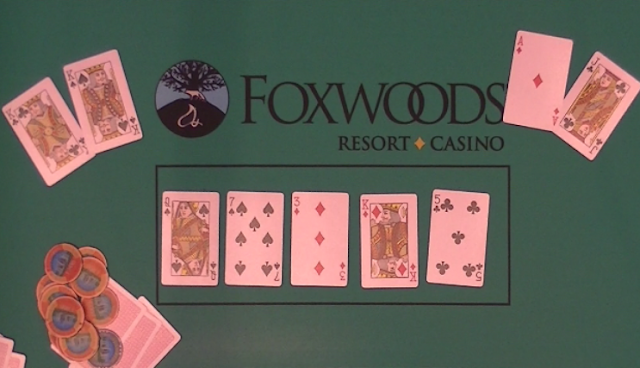 All four players checked the [6d][4c][2s] flop. When the turn came the [8h], it checked to the player in the hijack who made it 15,000. Only the small blind called. Both players checked the [ks] river. The small blind turned over [6h][7c] for a pair of sixes. The hijack showed [8d][10d] for a pair of eights. The crowd hushed as Orme looked down at his cards and peeled them over one by one. The first card, the [8c]. "Ooooo...I have outs," Orme says as he rubs his palms together. As he flips over the [ac], the crowd goes wild. He is awarded a full double. And the player in middle position that folded the turn told Orme he folded a king, and would have knocked him out on the river. @TheCJorme @FoxwoodsPoker let's gooooo!! All in against 5 to survive with one big on the bubble. Haha so sick. The very next hand, a player at another table shoved all in under the gun for 30,000. With a 300,000 stack, the small blind called without even looking at his cards. The original raiser showed [ac][qc] against the blind's [8s][7s]. The board ran out [8d][7d][4c][jh][10d], eliminating the player on the bubble. 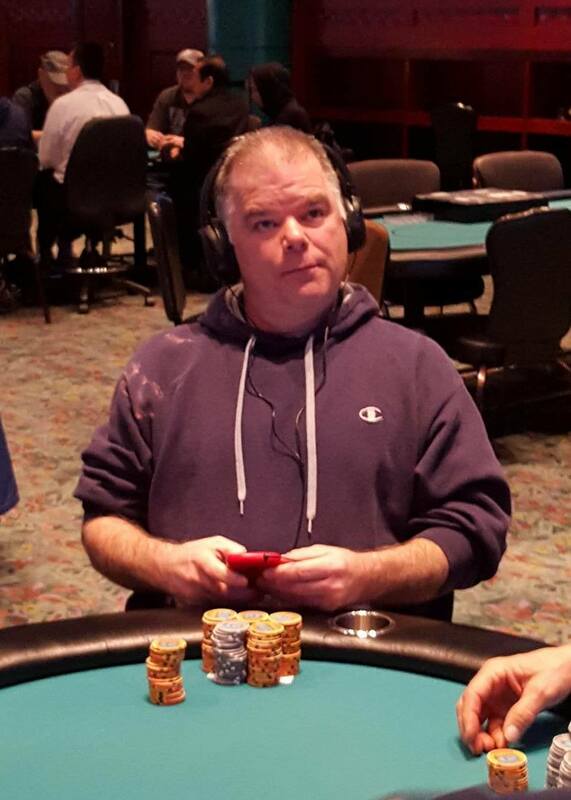 Chris Orme makes it through to Day 2 (and is guaranteed at least a $1,259 min cash) with a total of 9,000 in chips. Tony Martino makes it 30,000 in middle position. The player in the cutoff shoves all in, having Martino covered. Realizing that there is a player at a neighboring table with only 2.5 big blinds, Martino goes into the tank, and after nearly three minutes of thinking, throws in a chip to call. The board runs out [7s][4c][2h][6d][4h], and Martino is awarded a full double.